Littlehampton Town Football Club picked up a point in their Southern Combination League Premier Division derby tussle with rivals East Preston at The Lashmar last night. Scott Packer struck six minutes in after returning from Shoreham but Ryan Quirke netted his second goal in as many matches as it ended 1-1. Midfielder Packer went from hero to zero as he was shown a straight red card by referee Connall Bartlett for his reaction following a challenge on Josh Etherington. Golds faced more than an hour a man light but a superb defensive rearguard ensured they came away with a point. Littlehampton interim boss Mitchell Hand saw a maturity from his team that he hadn’t previously and said: “All in all it’s a point gained. The sending-off was really disappointing as it looked like nothing at all, me and the East Preston management team were actually trying to work out what it was even for. It was very strange and ruined the game really. “The boys did what I asked of them, which was to stay compact and protect what we had. “We did something we haven’t done a lot of yet and they showed real maturity to keep a shape and frustrate a talented East Preston side. Packer made a dream start to his Golds homecoming, firing his side ahead after six minutes. East Preston, playing their second match in just three days having gone seven weeks without a fixture, were not behind for long. Quirke struck for the second game in succession to bring the home side level 14 minutes later. A major talking point then came five minutes later. Packer and Etherington came together following a strong tackle by the former and his return was ended early as he was shown a straight red card. Golds were left with it all to do but defended valiantly to hang on for a point. Attack after attack came from East Preston. Forward Daniel Huet had the ball in the net ten minutes from time but he was adjudged to have been offside as it finished 1-1. Given EP’s impressive comeback win over Loxwood last time out, it was a point that pleased boss Bob Paine. He said: “We’d have liked to have taken all three points and probably should have down with them down to ten men for so long. 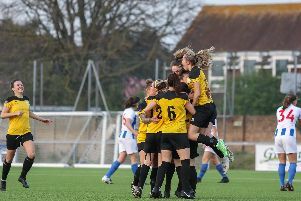 “There was just no way through, we tried everything but credit to Littlehampton for the way they defended and kept us out. East Preston travel to Chichester City in the league on Saturday, while Golds go to Saltdean United.